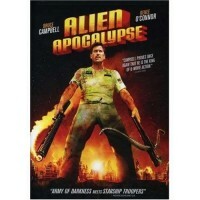 Bruce Campbell plays Dr. Ivan Hood, astronaut osteopath, who returns to Earth from a 40 year mission in outer space. What he finds is a planet defoliated by space termites, who rule the world’s feeble minded populace through fear, intimidation and decapitation. 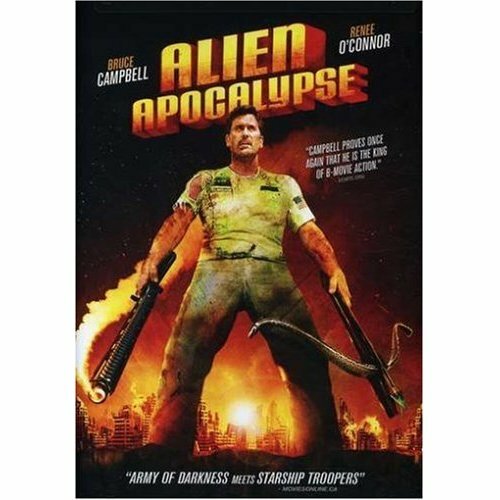 Before long he’s killing aliens, wowing the ladies and leading the human rebellion with all the bravado and smarm that only Campbell can deliver. Thoughts? This one’s not a thinker. In truth this film promises very little, low-budget effects bad acting, and underwhelming dialogue. This film has clearly learned from the Star Trek ‘It looks like the past, but it’s actually the future’ method of cost-effective set design. It’s almost as if the bad acting is on purpose, It’s so convincingly on-purpose. Bruce Campbell is wonderful as always, that man could have made Ishtar watchable. As terrible as it is, I really enjoyed this film. Of course I usually enjoy terrible films. Two things I really liked. 1. Even though aliens are destroying and exporting all of the world’s trees, the film doesn’t make a play at delivering an environmental message. This film is clearly planted in the “You get a lot further with a smile and a gun” genre of sci-fi flicks. 2. Campbell’s character is revered in an almost Christ-like manner. Blasphemy, pshaw. I’m all for it. He’s already played Elvis, give the man a shot at the King of Kings.